Hello and welcome to Ms. Ruhland's webpage! Here you will find out a little bit about Ms. Ruhland and what she is up to with her students! 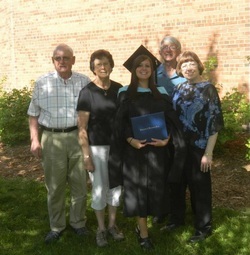 I graduated from the University of Wisconsin- Stout in May 2012 with a Master's Degree in School Counseling. Prior to that, I attended the University of Minnesota and received my Bachelor's Degree in Child Psychology. I am originally from Portage, WI, and currently reside in Madison. I enjoy dedicating my time to my students, and love seeing them grow over the years. My motivation for becoming a school counselor is my dear friend Paula Thomson. Paula passed away during our senior year of high school from undiagnosed congestive heart failure. Her dream to become a nurse and help others is the driving force that kept me focused during my six years of college. I knew that the medical field was not my place, but for her I decided to help children in schools. During graduate school, I worked as a practicum student in the School District of Elmwood and as a full time counseling intern in the School District of Spring Valley. I started my professional career as a long term substitute counselor at Al Behrman Elementary in Baraboo, and finished out my first year as a long term substitute counselor at Waubesa Intermediate School in McFarland. I am excited to be in my fourth year at Waubesa Intermediate School! It is so amazing to be able to see my students grow! A school counselor is someone who works in elementary, middle, and high schools to assist with academic and personal/social development, as well as career preparation. Duties vary depending on the needs of the school, but most elementary counselors meet individually with students, facilitate small groups, and present classroom lessons to all students. All school counselors are required to have Master's Degrees. School counselors generally have their own offices for confidentiality, and they are often filled with books, games, and many other resources. As a school counselor, it is my mission to work with alongside administration, staff, parents, and community to support students as they gain the skills and knowledge necessary to make a positive contribution to a changing world. This will be accomplished by implementing a comprehensive school counseling program to provide a safe and caring learning environment in which academic, career, and social-emotional development is possible. The vision of the Waubesa Intermediate School's counseling program is to provide a comprehensive school counseling program that addresses the academic, social, and emotional needs of all students. To advocate for the needs of all students and staff, regardless of differences in gender, religion, ethnicity, race, ability, and age. To work collaboratively with students, parents, staff, and administrators to create an environment in which learning is not only possible, but achievable. To provide leadership at a building and district level that promotes positive systemic changes in order to best serve all of our students academically, socially, and emotionally. To be preventative and proactive by teaching students important life skills that will allow them to be successful individuals in our community. To recognize the uniqueness of each child and encourage the development of individual strengths and weaknesses of all students. In order to be the best school counselor that I can be, my first and most important goal is to learn all of my students' names within the first few weeks of school. As a long-term substitute, this task has been so important but so difficult to complete. Now that I have finally found my good-fit school in McFarland, I feel that this task will be much easier when I am here from one year to the next. My second very important personal goal is starting a Kindness Club. After watching a video on Random Acts of Kindness, I decided this is also a wonderful idea for younger students. UPDATE: I am currently working with the 5th grade Student Council to create more leadership opportunities for our students. We split the council into three different groups, and one is based on our middle and high school Ambassador programs. Our Junior Ambassadors will complete acts of kindness and service projects for our school and community. Ms. Ruhland loves to play games during recess with her students! 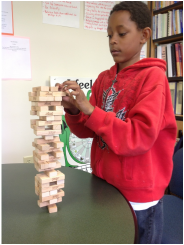 Jenga is a favorite in my office!